Easons Wholesalers are one of the main book distributors in Ireland and as with any order taking, picking, packing and distributing business, production systems are paramount to operational efficiencies. Easons take orders from hundreds of bookshops everyday and receive stock from suppliers everyday. The manual systems were becoming less efficient with the volume of orders going through. Easons decided that an automated system would significantly improve accuracy and speed of orders and installed a sortation system. The sorter sorted the books into the correct box and then needed to be transported to the distribution area. LVP Conveyor Systems Ltd. were approached by Easons to provide an automated conveying system which would speed up the process from packing to distribution. 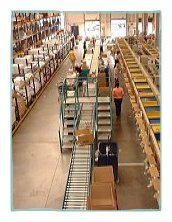 The conveyor needed to carry boxes of books from the automated sorting area through to the packing area. LVP chose a line shaft powered roller as the best option primarily because of weight and how easy it is to control the product on the line. The system was installed within 3 weeks and Easons were delighted with the improvements in efficiencies. Boxes were going with the correct books and going to the right destinations with increased volume and throughput.